Every civilization is largely defined by its ability to control energy flows and reserves. In this sense, it is hard to doubt that our civilization is only a transitional phase. Looking to the future the issue is: what will be the shape of the new solar society? We know that two different models are now possible, one still based on a centralized and delocalized production, an other one based on a local, diffused and highly networked production. If both models are possible, not only the diffused nature of the solar resource, but mainly the deep social challenge of giving people the ownership of the tools of energy production, makes the diffused model the real ecological challenge of a new civilization. And this challenge, has indeed a lot to do with architecture. Because it means to imagine our built environment, our private houses and offices as well as our public and common spaces, as the new, visible and tangible, spaces of energy production. It means stopping to think architecture as a static, armless space to start thinking it as a “productive” entity, according to the needs of its inhabitants but also to the global needs of the planets. Moving form these theoretical bases, the paper discuss the results of a post-graduate master, “Designers of Sustainable Architectures” promoted by InArch (Italian National Institute of Architecture), presenting a new design method based on what we called the “productive footprint”, defined as the amount of different surfaces (mainly for energy and food production and water recycle) needed to sustain, through on site renewable resources, life in each specific context. The paper also argue the possibility to use the same “productive footprint” as a measure of the productive capacity of a project. Based on the relation between consumption and regeneration capacity, the footprint could be negative, balanced or positive, giving designer and citizens an easy and communicative tool to understand the metabolic impact of a built environment. Every civilization is largely defined by its ability to control energy flows and reserves. Human history itself can be seen as an ongoing discovery of the possible manifestations and mechanisms of energy conversion: starting about ten thousand years ago with the first agricultural techniques that would determine and enhance the earth’s productive capacity to answer to our vital energy needs – food – up until the discovery of how to release energy from the nucleus of the atom in the late 1930s, to the recent understanding of photosynthesis. From the food we eat to the heat that warms us to the light that illuminates our world to the means of transport by which we move, the forms of energy that we use determine the shape of the society we live, in terms of both time and space. In this sense, it is hard to doubt that our civilization is only a transitional phase because, unlike preceding civilizations, it cannot last for thousands of years because even if they were used in the most efficient possible way, fossil fuel energy supplies are limited as well as the Earth capacity to absorb their outflows, with consequent increasing economical costs. This, as we know, will force our descendants, if not ourselves, to return to harnessing solar energy or developing new energy sources. As well as to re-design our relationship with the Earth, its resources and the global system of matter and energy flows. Looking to the future the issue is: what will be the shape of the new solar society? We know that two different models are now possible, one still based on a centralized and delocalized production, an other one based on a local, diffused, distributed and highly networked production. If both models are possible, not only the diffused nature of the solar resource, but mainly the deep social challenge of giving people the ownership of the tools of energy production, makes the distributed model the real ecological challenge of a new civilization. And this challenge, has indeed a lot to do with architecture. Because it means to imagine our built environment, our private houses and offices as well as our public and common spaces, as the new, visible and tangible, spaces of energy production. It means stopping to think of architecture as a static, armless space to start thinking of it as a “productive” entity, according to the needs of its inhabitants but also to the global needs of the planets. But getting to this productive point of view, the energy issue appears deeply connected at least to the issues of water and food, the other two main needs of human dwelling. The reason to adopt the productive perspective is actually linked to wider considerations about the search for a more balanced, or ecological, way of dwelling. In fact, if as we know, the Earth’s vital signs (such as temperature, air, soil and water quality as well as biodiversity) tell us about a growing state of crisis of the planet, learning how to design according to nature should become our most urgent ethical and practical goal. And since the only real example we know of a system able to produce well-being for unlimited time is nature itself, where nature means biological systems, systems able to use matter and energy without producing waste but just closed circular chains, nature has to become our main model and reference. 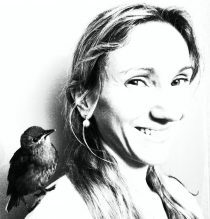 And what nature show us are mainly relationships: an ecosystem is a system of highly networked (living and not living) elements which can be defined as “productive” if it is able to maintain air, water and soil quality, allowing life, or biodiversity, to prosper (when this not happen, the system is sick). This is actually what we have to look for: the ability to design hybrid productive environments (where hybrid means part natural part artificial), capable to sustain life, in a wide sense. But this point of view, immediately call into question the choice of modern age of addressing the main needs of human dwelling dividing and spacing out as much as possible the place for shelter, the place for food and the place for energy production without taking care of all the outflows implied in this separation. So that, for example, cities, poor of green and permeable surfaces, and full of heat sources, became more and more islands of heat, needing growing artificial oxygenation through air conditioning. It it quite clear that if we want to balance our built environment we have first of all to re-connect, through a systemic strategy, the main needs of dwelling. In other terms, we have to think that beside the specific and occasional requests of a program, each project should have an hidden, meta-program, general and invariable: to look for a form able to relate vegetation (food, fresh air, biodiversity), shelter (built, public and private space) and (renewable, distributed and clean) energy. Which means we have to think the project as design of a set of relationships. Not in a metaphoric sense, but in an objective and measurable one. As we can actually quantify how much solar radiation a building (or an urban area) is capturing and transforming in usable energy, as well as how much energy the building needs, and how many trees and green surface the building is supporting, and how much productive land and water regeneration through a “living machine” are connected to the building, and how all these things are related and work together. But how to actually design this set of relationships? In several years of teaching in the post-graduate master “Designers of Sustainable Architectures”, promoted by InArch (Italian National Institute of Architecture), we experienced the difficulties of even young architects to change their point of view to imagine architecture as the dynamic scene of matter and energy flows, we understood that a new design method was needed. We call it the “productive footprint” method, assuming that a paradigmatic shift is possible if we start the design process thinking about the energy flows, looking for the different surfaces needed to sustain, mainly through on site renewable resources, life in each specific context. In this way, the meta-program of correlation (between shelter, energy and food/water/vegetation) become a new programmatic layer which has to be added to every standard program (a single family house, an office, a school, a new neighborhood, a city) which looks specifically to the matrix of productive surfaces implied by each of these objectives that have to take shape in the design process. Beyond the didattic purpose, the idea of a “productive footprint” is an attempt to set a common ground in between the scientific perspective and the architectural one. It has to be understood, in fact, as a planning tool, which takes some “productive” needs and data as inputs for designing new city and buildings. The aim is not balancing totally the “ecological footprint” (negative) of the intervention by a “positive” ecological footprint, but, rather, to experiment with how much of this “positive ecological footprint” can be included into the architectural design. Experiments carried out in past (such as Biosphere 2), in fact, demonstrate that at the moment we do not have enough knowledge to exactly reproduce the nature’s performance. Of course, thinking about the built environment as something which has an energy footprint which has to be taken in account (instead of just imaging that energy, as well as food and water, will come to the site from far away, in a non renewable form, will be consumed and thrown away as waste), immediately generates new questions about what kind of food-footprint shall we imagine for an office or what kind of transportation-footprint shall we consider for a school and so on. But this is exactly the kind of questions which can help us understanding that if we want to change the way we inhabit our planet we have to change dramatically the way we think of architecture. Moreover, this kind of approach make it immediately clear that the most we reduce our need for energy, food and water, through more performative spaces, appliances and behaviours, the better it is. For sure, understanding the “measures” into these relationships (how much of…) would be the element we need to define exactly the “productive footprint”. From this point of view, each design process is a way to experiment with this crucial topic of the discussion. Due to the need for renovation of existing buildings in the Italian contexts, we decided to focus the master on retrofitting case studies, which year after year change in location and program. 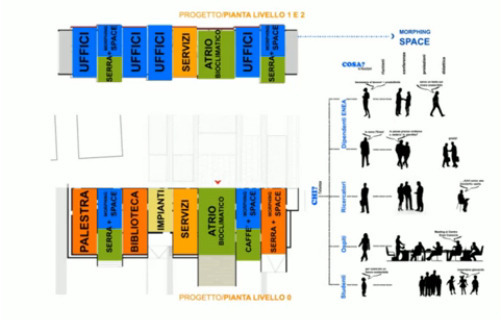 So after working on housing in the historic centre of Rome [1; 2] we now focused on an office programme located just out of the city. Due to a ten years long collaboration with ENEA (Italian National Agency for New Technologies, Energy and Sustainable Economic Development), we decided to study the architectural and energetic re-design of two selected buildings of ENEA’s Casaccia Research Centre area. 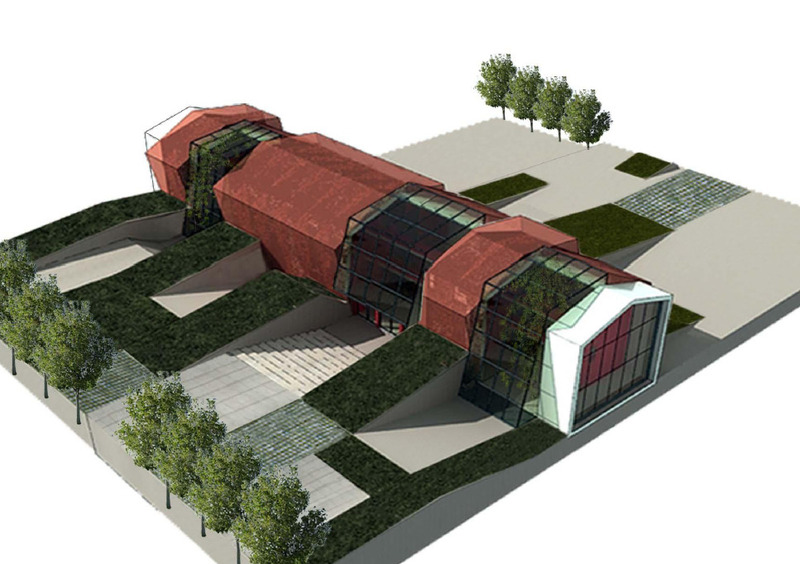 The Casaccia Research Centre is ENEA’s largest complex of research and development facilities. It is an area of about 90 ha, located around 25 kilometres northwest of Rome, near Lake Bracciano. It is a centre dedicated to research, development, applications, and the dissemination of innovative technologies. Here we selected two different buildings as case studies for a future renovation plan of the whole area. The first one is the main Entrance Building, the second one is an Office and Laboratories Building very close to the main entrance. Both buildings have been studied in relation with the surrounding open areas considered as useful surfaces to provide the “productive footprint” of the buildings together with the building’s surfaces. In both cases, students were invited to keep the main volume of the existing buildings but they could redesign the envelope, carving courtyards or adding greenhouses, so to optimize the energetic behaviour as well the architectural performances of the buildings. We will present two selected project, one for each case study. Project One. The Entrance Building (design: F. Calcerano, R. Delli Carri, A.Valeriani) is a glass and steel structure, with a very compact profile and just one store high. Despite the small dimension (about 200 m2), it is characterized by a high energy consumption (116 MWh/year) related to the use profile and the building performances that requires a continuous use of the air-conditioning, and,also, of artificial light for 24 hours. Moving from this analysis, the main idea of the project is to re-organize the building so to have two separate zones, defined by different use profiles: the core zone, with a continuous use (h 0-24), and an external zone with a daily profiled use (h 8-18). 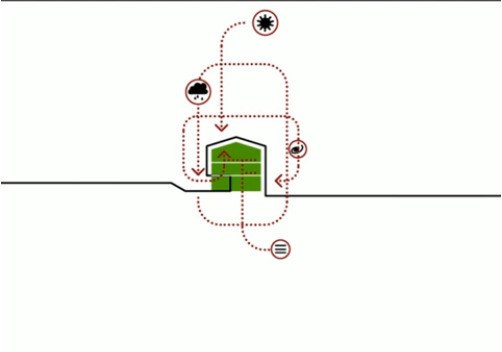 Furthermore, the external zone is protected by an additional buffer zone, made of greenhouses and other filters. To summarize, the basic idea is having three concentric rings, with different performances. Moreover, since lighting was an urgent energetic problem, some glazed courtyards have been used to improve the daylight in the core zone. The whole system with rings and glazed courtyards, is not larger than the existing roof. The re-design of the roof itself is another important feature of the energetic, as well as architectural, project. Through a new tilt, the roof is turned in a garden and solar surface, able to optimize the passive and hybrid behavior of the spaces beneath as well as to generate all the needed electric energy. Simulations (COMSOL) show that, despite the occupied surface is now more than doubled (465 m2), the intervention allowed for reducing drastically the energetic consumption to 7,4 MWh/year. The building renovation proposal is actually part of a wider design strategy. 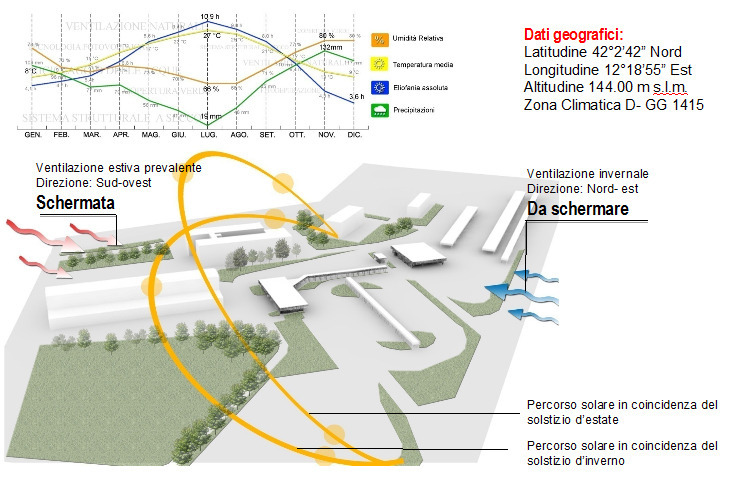 In fact, even if in this case the energy footprint was easily located on the building, the open area in front of the entrance is turned in a sort of tecnological-landscape, a kind of learning-ground, where people can get curios about sustainability by looking at technological systems, exhibited as part of an open-air museum. The technological systems people can experience by walking in the park are: hydroponic greenhouse, phyto-depuration systems, rain water collecting systems, and also a geothermal exchanger (generally hidden and here emphasized). Another important feature of the project deals with the design of a new mobility system: in fact, since the research centre location 20 km out of Rome city centre, 16 ENEA bus are now travelling everyday back and forward to connect the centre to the city, with an annual cost of 2.000.000 euro. The proposed mobility system consists of a pool of shared electric cars to be recharged in the 8 hours parking under PV shelters. The payback time of the whole investment is less than two years and the avoided emissions of CO2 is about 5600 t, equivalent to 900 ha of wood. Project Two. The Office and Laboratories Building (design: F. Becchi, N. Di Molfetta, C. Escalona, F. Fontana) is a bricks and concrete, three stores, rectangular box with, as the analysis pointed out, many thermal bridges in between the vertical and horizontal structural elements, and a not really performative insulation covering, with a high energy consumption (209,3 MWh/year). The project here aims on one hand, to improve the energetic performance of the building and, on the other hand, to enhance the interaction between people who use the building, emphasizing the identity of the building itself as a facility for research and researchers. This is the main reason why the analysis phase has been carried out together with a deep reading of the life and desires of people working in the building and the centre in general, through interviews and contextual analysis. The analysis process ended up in the choice of adding a new envelope to the existing one (energetic performance), shifting the “section” according to the environmental needs and modifying as well the internal layout of the offices (users satisfaction). The new envelope has been conceived like a “selective and productive filter”, which can mediate the relationship between outdoor and indoor. This filter, made of movable panels whose opening is controlled by a central system, is also a very clear element of the facade composition. By opening and closing the panels, depending on the external conditions, it is possible to regulate natural ventilation, passive cooling, solar gains, daylight. The change in the building section, allow also to incorporate passive and active strategies to improve the energetic performance of the building and to reduce its energetic consumption. 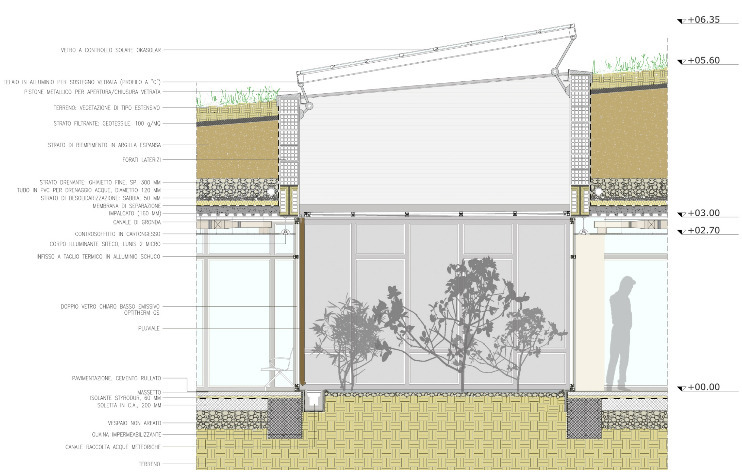 As passive elements, a bioclimatic atrium and two greenhouses, have been used to maximize the passive solar gains. In addition, buffer spaces have been added on the South sides of the building, to prevent overheating in the hot season, with a final total energy consumption of 99,4 MWh/year. Main active elements are an earth-pipe geothermal system, a solar thermal system, and a photovoltaic system. All the systems that have been used (passive and active) have been conceived so to work as a “whole” and their precise dimensions and shape have been evaluated verifying their effectiveness and performances through thermodynamic simulations. Due to the fixed dimensions of the suitable surfaces for PV on the building, some other photovoltaic elements have been used “at site”. In fact, 44 PV horizontal “umbrellas”, able to produce 44,1 MWh/year, have been placed in the external area of the building as new productive elements bringing in the open, public space the issue of solar energy production . 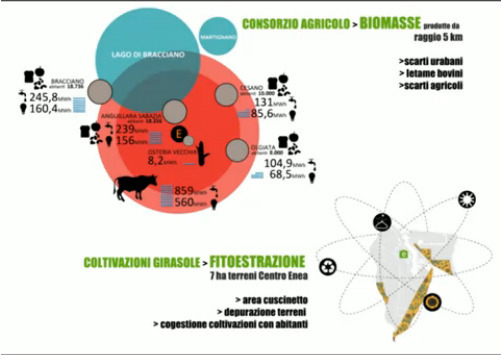 Because of the agricultural nature of the external landscape, the project imagine also to re-design the borders of the research center developing a system of biological gardens, for fresh food production and biomass, to be managed together with people from the surrounding neighborhoods. To design relationships instead of boundaries means a radical paradigm shift in our way of thinking architecture as a solid and inanimate artefact, alternative to natural and evolving space of plants and animals as well as to the productive land of the countryside and of the energy plants. From this perspective, a new hybrid and flexible reality replace these strong oppositions: a system of weak and diffused urbanism, a country-city and landscape-buildings, where the hard and impermeable concrete or asphalted surfaces, live in continuity with soft and permeable green surfaces which, in their turns, live in close continuity with advanced technological surfaces able to capture the diffused environmental energy. This is not greenwashing but a dwelling-growing-breeding where every building is also a station for food and electricity production, as well as for water treatment and re-cycle, for services and irrigation. A system capable of sustaining more life than just human life. More life meaning also a better quality of life: because more green areas means more playgrounds, more relational spaces, more connection with the basic elements and cycles of life, more tastes, colours, smells. A. Scognamiglio, E. Di Munno, V. Temporin & M. L. Palumbo, Use of Photovoltaics in historical buildings: an architectural approach, Proceedings of the 24th European Photovoltaic Solar Energy Conference, Hamburg, Germany, 21-25 September 2009, pp. 3922-3930, ISBN 3-936338-25-6. 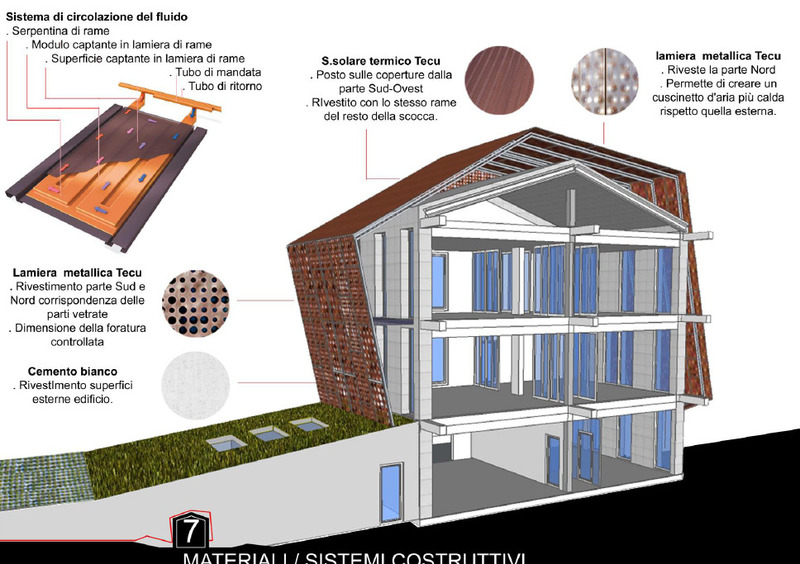 A. Scognamiglio, E. Di Munno, M. L. Palumbo, V. Temporin, Sustainability for the dialogue between traditional buildings and new technologies, Proceedings of the CISBAT 2009-International Scientific Conference Renewables in a changing climate. From Nano to Urban Scale, Lausanne, Switzerland, 2-3 September 2009, pp. 137-142. A. Scognamiglio, C. Privato, Starting points for a new cultural vision of BIPV, Proceedings of the 23rd European Photovoltaic Solar Energy Conference, Valencia, Spain, 1-5 September 2008, pp.3222-3233, ISBN 3-936338-24-8. M.L. Palumbo: New Wombs Electronic Bodies and Architectural Disorder, Birkhauser Verlag, 2000.